Lockdown at Rancho Tehama School saved students’ lives during mass shooting. 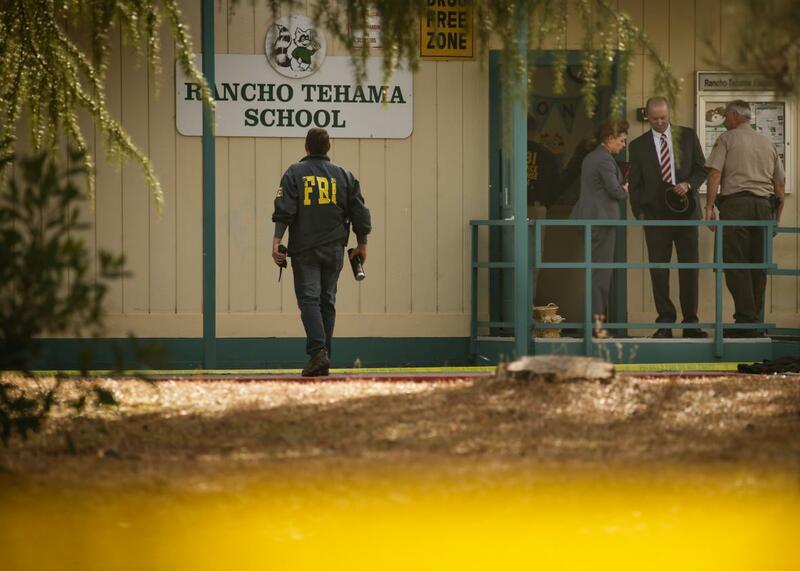 An FBI agent pictured at Rancho Tehama Elementary School, where a lockdown prevented a mass shooter from killing students. Rancho Tehama School, which has an enrollment of around 100 students, was one stop in the middle of the shooter’s seemingly random rampage. (Update, 1:53 p.m.: The sheriff’s office announced that Neal first killed his wife and hid her body in their home.) According to national and local reports, Neal shot two neighbors with whom he’d been feuding, including a woman who had a restraining order against him for a previous violent attack, then sped away in a stolen truck. “­The bell had not rang, roll had not been taken, when the shots were heard,” said Corning Union Elementary School District Superintendent Richard Fitzpatrick. Students, parents, and teachers rushed into classrooms, locked doors, and sheltered in place under desks. “This was a question of minutes,” Fitzpatrick added. Neal crashed his vehicle through the school gates but was unable to enter classrooms, so he stayed outside the school for six minutes and fired through the windows and walls before continuing his shooting spree elsewhere and being fatally shot by law enforcement. He wounded one student, who was taken by helicopter to a hospital. Two-thirds of schools in America practice active-shooter lockdown scenarios. While these shelter-in-place drills have incurred controversy because they scare children, in the case of Rancho Tehama, the lockdown procedure kept students safe.